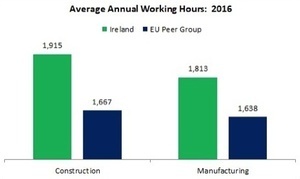 Irish construction employees work more hours than any other sector, and 15 percent more than our peer group average – 248 hours annually, or the equivalent of 6.4 weeks more per year. A possible contributor to this high level of working could be the emerging labour shortage in the sector. 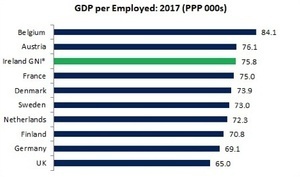 Belgium, which has the lowest annual hours worked and the highest number of paid days off, has the highest GDP per person employed (factoring in living costs). 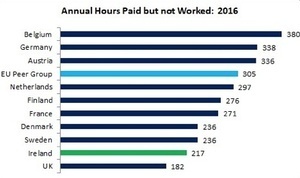 On the other hand, the UK has the highest working hours and the fewest paid days off. Yet they are at the bottom. 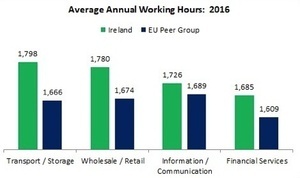 Ireland, while ranking third, is clumped together with a number of other countries which have fewer working hours and more paid days off. 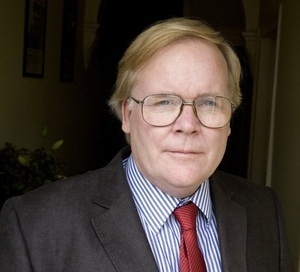 Posted in Misc and tagged Michael Taft, Taft on Thursday at 10:38 am on March 21, 2019 by Michael Taft. To be honest i would settle for 1 bank holiday every month. I do wonder if the diff in construction sector hours is down to the bogus “self employed” status of most construction workers. Most self employed generally work harder than paye, take fewer holidays etc. Yeah they’re being fleeced by their employer that know damn well these guys don’t understand their employee rights and are given forms to sign asserting that they are contractors. It’s rampant employer abuse. Also construction industry hours are insane. 7am til 6pm is the norm for trades workers. Office workers slightly less but engineers often do more work after hours. Would prefer a four day working week with defined outputs but with the fifth day devoted to skills and training – be that in a formal setting or online from home. Win-win for employers and employees, and the general health of the skills force. It would also stamp out ageism in the workplace. The link to the data above is a zip file which won’t automatically open on most people’s machines. I wonder how accurate the info is. 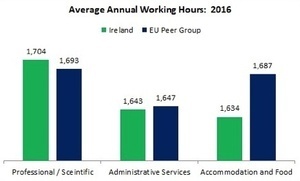 This Eurostat report shows Ireland having one of the lowest working hour weeks, below the EU average. No disrespect Michael, but it would be nice to be able to access your source info. The vast majority of computer users should have no issue with a zip file. Also the link took me to a webpage where I can look at the data or download one of many formats csv, xlsx, pdf, spss in a zip file. In Belgium, people work very short hours, which is nice. The downside is when they are off work, so is everyone else, and it is very hard to buy things. This is true – partially due to the fact that the costs of hiring additional staff are so high that many shops won’t consider it worth their while. Eoin – you might try again. When I click on the link it opens up to a dataset, not a zip file. 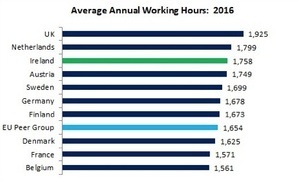 The Eurostat you link to is correct – but it refers to “number of hours per week at their main job”. It doesn’t break down hours actually worked and hours paid but not worked. While the numbers per week in the main job is 39 hours, this doesn’t include holiday time, etc. No one (hopefully) works 39 hours per week, 52 weeks per year. Thanks Michael, it might be my device but it is fairly accommodating. Having tried again, the link still tries to open a file “show.gz” and the “gz” extension is a zip thingy and only a 1kb file at that. Will study your point later. Thanks. This should get you to the dataset, hopefully. I followed your link, and look at data for all fulltime employees, but use ALL company sizes, restricting for (B-S_X_O Industry, construction and services (except public administration, defense, compulsory social security) ) then I get a different picture. 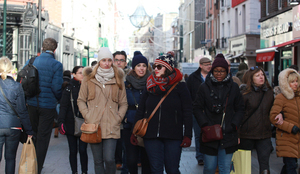 Ireland 2016 has 1,095,581 employees working 1,858,248,964 hours. or an average of 1,696… which is 40 hours more than the EU peer group you mention. When I look at construction the average drops very slightly 1915 to 1898 – but the number of employees goes from 45,543 to 73,290!! 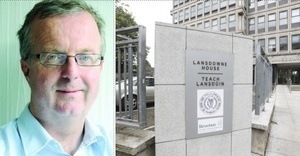 Cian – I used 10 or more because most countries in our peer-group don’t report for Total , so there could be no comparisons. I used full-time as the proportion of part-time varies (e.g. Netherlands) so that we don’t know who is working more than others on a like-for-like basis. And I used the market economy and its sectors as these are the sectors that will have the most difficulty adjusting to a shorter working week (non-market sectors are largely public sector or public subsidized). Thanks for clarifying this. You did mention the last two items in the article – but didn’t mention the first. I really enjoy your articles, and really appreciate that you link to your sources, and (mostly) explain your data choices. The fact that the x-axis is not 0 on the various bar charts is deeply irritating and misleading. It’s perfectly standard when you have a limited range. It’s not a problem when it’s clearly labelled. Which it isn’t, in this case. Charts should be illustrative, of course, but these appear to deliberately exaggerate relatively small differences. I disagree. Strongly. it is very misleading. And in the case above it isn’t clearly labelled. The fact we have 9 bank holidays really annoys me. It should be made a nice even 10, with a start of July bank holiday added. Then we’d have one in each of May/Jun/July/August across the best weather months. 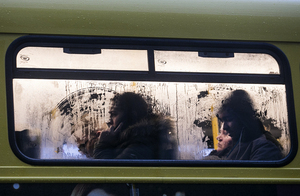 It would also bring us more in-line with European norms, where most countries have 10-12. Surely this would be supported by pretty much every voter. Irish political parties love populist measures in good times, one of them needs to hop on this. What? if you are doing it based on being “a nice even” number – why not got all out for 12? one per month? Baby steps. 12 would be lovely, but adding 3 bank holidays in one go would be a lot. 10 is an easier initial step.